The Orangutan Foundation International works to protect wild orangutans and their rainforest habitat, as well as to rehabilitate wildborn ex-captive orphan orangutans for life in the wild. OFI’s goal is, ultimately, to save orangutan populations from extinction and to better the lives of individual orangutans. To achieve this goal, OFI has established different programs which address these issues. 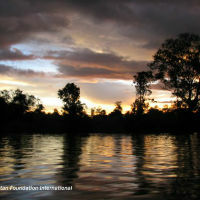 In 1971 Dr. Galdikas and Rod Brindamour started the Orangutan Research and Conservation Project. Established at Camp Leakey in Tanjung Puting Reserve (now National Park), it was the first orangutan rehabilitation program in Kalimantan. Orangutan Foundation International (OFI) works to help wild orangutans and to rehabilitate wildborn ex-captive orphan orangutans. 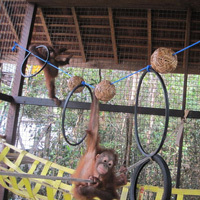 But OFI’s goal is, ultimately, to keep orangutans in the wild. This can only be done by protecting their rainforest habitat. OFI produces educational programs for schools, delivers public lectures, organizes conferences and seminars, training programs and disseminates news about orangutans, their plight, and orangutan and forest conservation issues. OFI’s roots are in research and better understanding human origins by studying one of our closest living relatives. Now, over 40 years later, OFI’s wild orangutan research program is one of the longest continuous studies on any wild animal population ever conducted in the history of science. 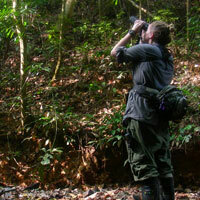 Thanks to GIS Mapping, we have a better picture of orangutan habitat in local areas. OFI uses high resolution satellite imagery combined with ground GPS field surveys to produce maps previously unavailable. 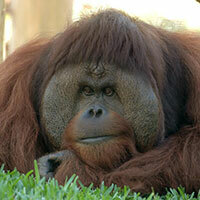 OFI helped rescue adult male orangutan Rusti in 1997 from a backyard zoo in New Jersey. Conditions at the zoo were less than optimal and provoked year long demonstrations by animal activitists. OFI designed a large, open air enclosure for Rusti at the Honolulu Zoo where he is now on permanent loan.